I’ve been working on the design for a 5 year old boy’s bedroom. 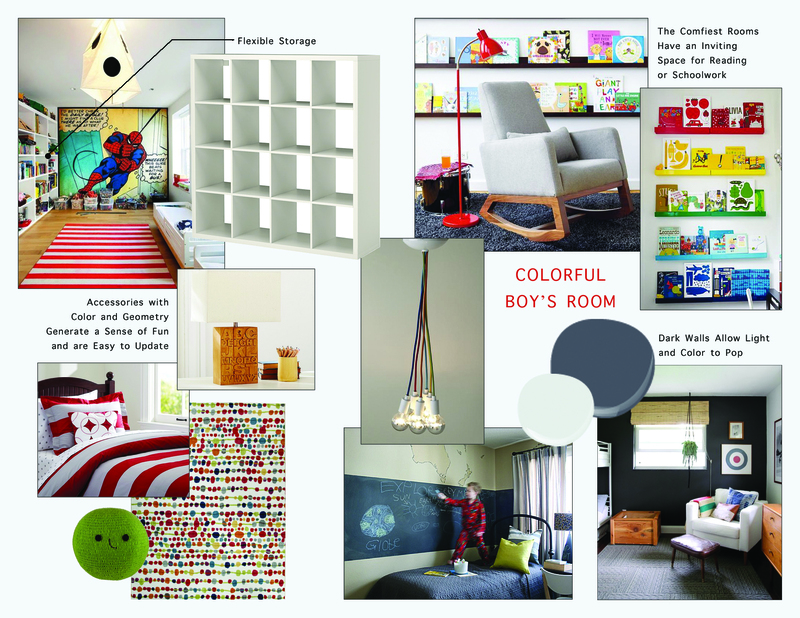 Certain aspects of kids rooms are easy (lots of color, yeah! ), but they present the unique challenge of capturing someone’s personality at a young age while still allowing plenty of room for that child to grow and evolve. As a general rule, I try not to go too themey. Then again, if a kid really loves a particular subject, it seems like a shame not to embrace that joyful enthusiasm and curiosity. And anyway, most kids believe that rules are made to be broken! So, in summary, there are no rules when it comes to kids rooms except this: Kids are fun. Their rooms should be fun, too. This particular little boy loves red, green, and black. However, black feels too heavy for this little dude, so I toned down his favorite shade to charcoal gray. Then I loaded on lots of bright color, geometry, and comfort for a space that exudes modern, youthful energy. Perhaps most importantly, I incorporated flexible storage into the design. As a mom, I have learned the hard way that kids have so much STUFF! And with every birthday, every Christmas, (every trip to Target) their collections of stuff keep changing and GROWING. I guarantee that when the ABC lamp and playful throw pillow are long gone, that Ikea shelf will still be around. Soft, cozy textures and curved edges create an atmosphere of comfort and relaxation. A palette of lavender, green, and teal against a neutral backdrop of cream, beige, and white sets a youthful, feminine tone. 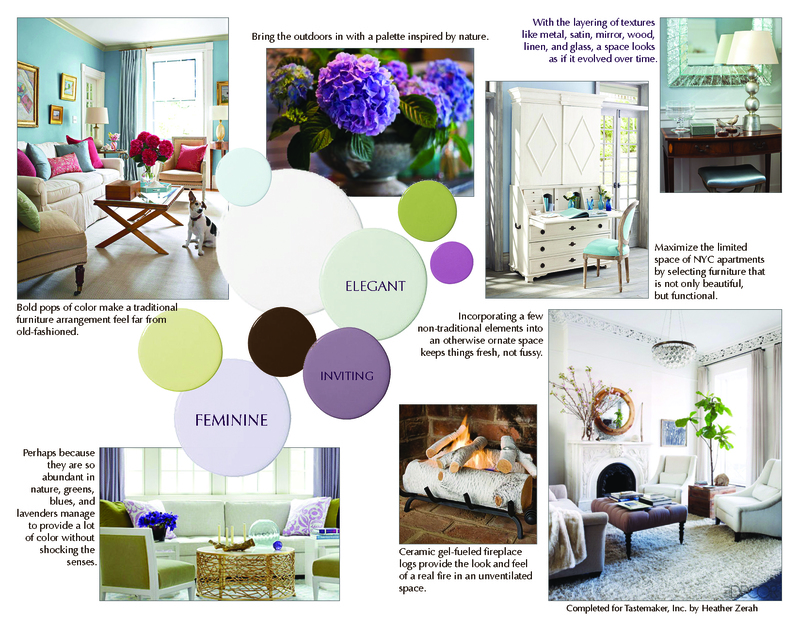 This mood board was created for a trio of young women preparing to move into an apartment together. The existing space was bright, white, modern, and urban, but their personal style tended more towards bohemian eclectic. Their living room needed to multi-task as a space for relaxing, socializing, and entertaining. 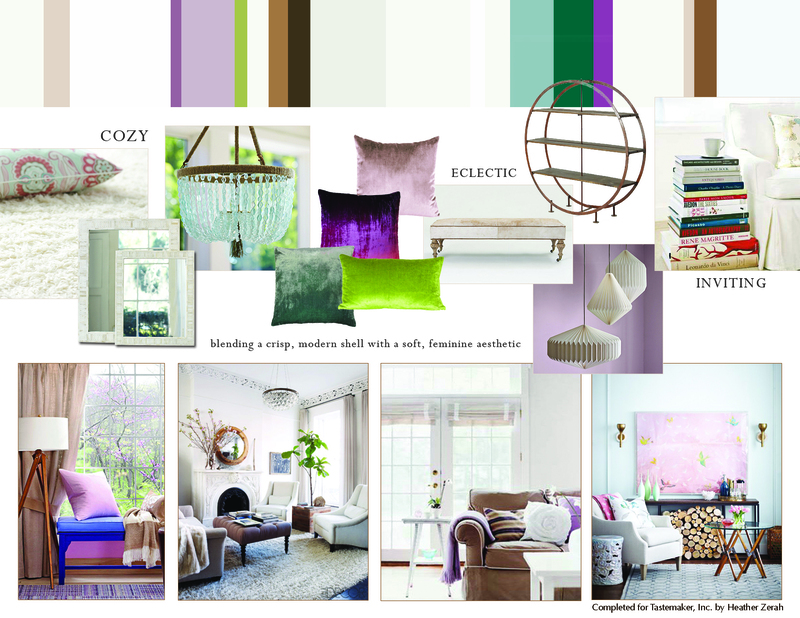 The layout of this mood board differs a bit from my usual style with a linear color palette, more furniture selections, and less text. Which mood board style do you prefer? As mentioned in my recent post, The Importance of Mood Boards in E-Design, a Mood Board is a collage of images that represent the interior designer’s vision for a particular space. 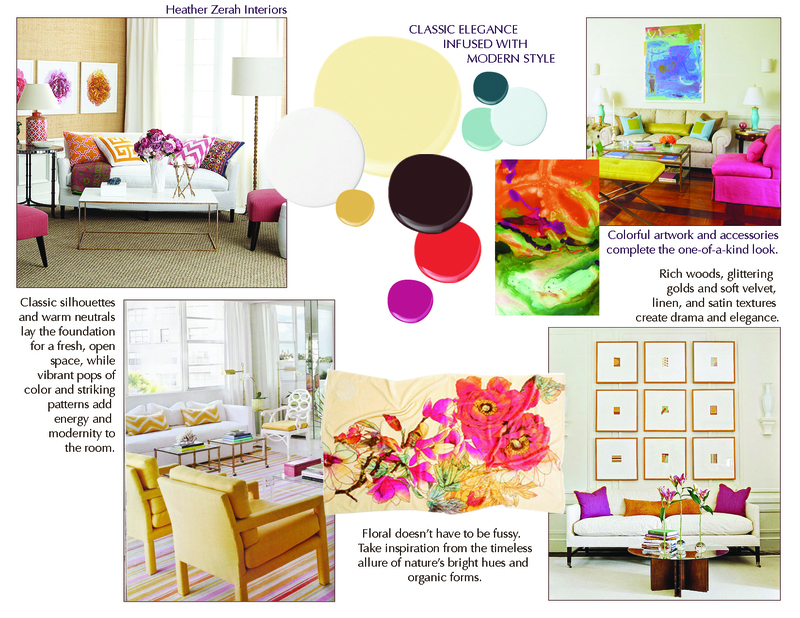 Mood boards often combine photos of rooms from design magazines and blogs, abstract images, and photos of furniture or decor that may eventually be used in the design. The designer’s vision is based upon the client’s initial description of their style, needs, and goals for their room. By gathering images together in a mood board, a designer can paint a clear picture to convey style, mood, color scheme, and more. I like to add text to my mood boards to ensure that the client can easily understand the reason I chose each photo. The goal for this project was to infuse a classic living room with new energy. The client’s style preferences straddled the border between classic and modern. We wanted a bright, colorful, layered space for entertaining guests that was neither stuffy nor minimal. I took inspiration from a gorgeous floral beach towel and sought to create the same color palette within the room, using a buttery yellow for the walls, pops of bright coral red and textured neutrals for the textiles, and softer accents of blue, brown, yellow, and pink throughout. Colorful artwork and glass lamps, as well as geometric mirrors and shelves added to the contemporary look of the final design, while rich materials like brass, velvet, and marble imparted sophistication and a hint of glamour. If you saw the Traditional Living Room Mood Board I posted last Monday then you probably noticed that this one looks pretty similar. That’s because both mood boards are for the same client. The house features an open floor plan with a clear sight line from entryway to living room to dining room. To make each room feel connected yet unique, I increased the depth of color from one room to the next. 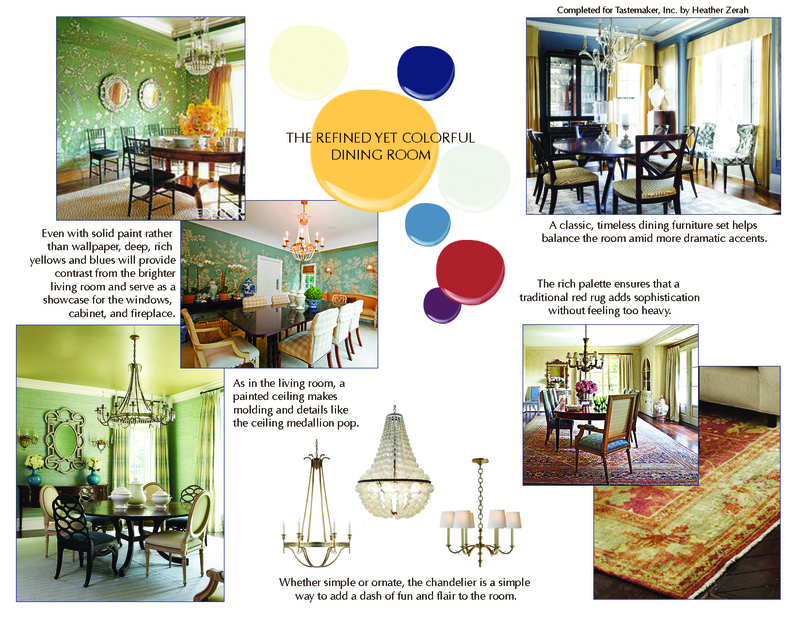 The basic color palette remains the same, but the dining room hues are more rich and saturated. The result is a dining room with a hint of drama befitting the home’s classic Victorian architecture. 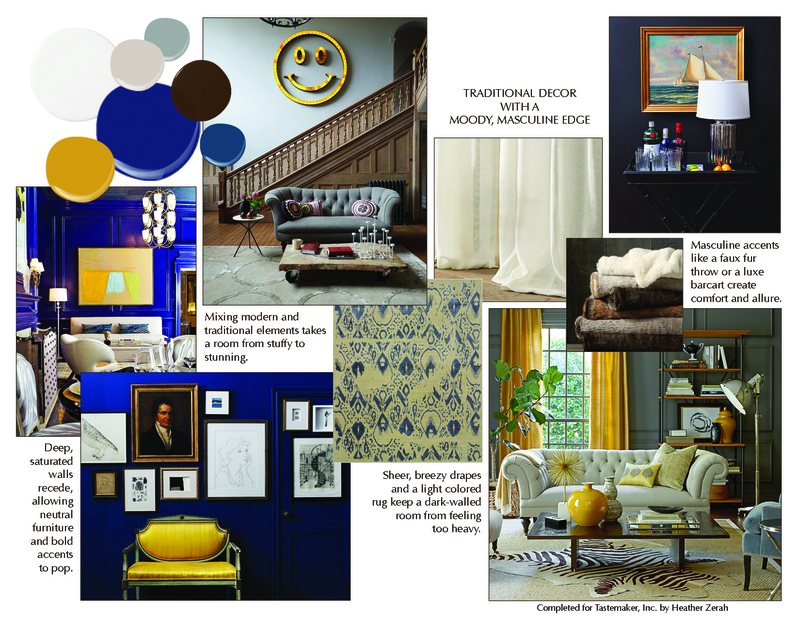 This E-Design Mood Board was created for a client who wanted to highlight her traditional taste without compromising the practical needs of an active young family, all in a classic Victorian home. Toddlers (yes, the tiny people, not some architectural detail you’ve never heard of), high ceilings, dropped molding, and a wide, open flow from one room to the next were just a few of the details taken into consideration when developing a concept for this space. If you who haven’t heard, E-Design (also known as E-Decorating) is a new way of providing design-savvy DIY clients with professionally designed interiors at an affordable price. Because the clients do some of the work themselves and the designer never actually meets the client or sees their space in person, interior designers are able to offer e-design services at just a fraction of the cost of traditional full-service design. The designer saves time by focusing only on the design portion of the project, and the client saves money. As a relatively new concept, the e-design process is still evolving. Through trial and error, designers and clients are discovering what works, what doesn’t, and how best to handle long-distance communication effectively. 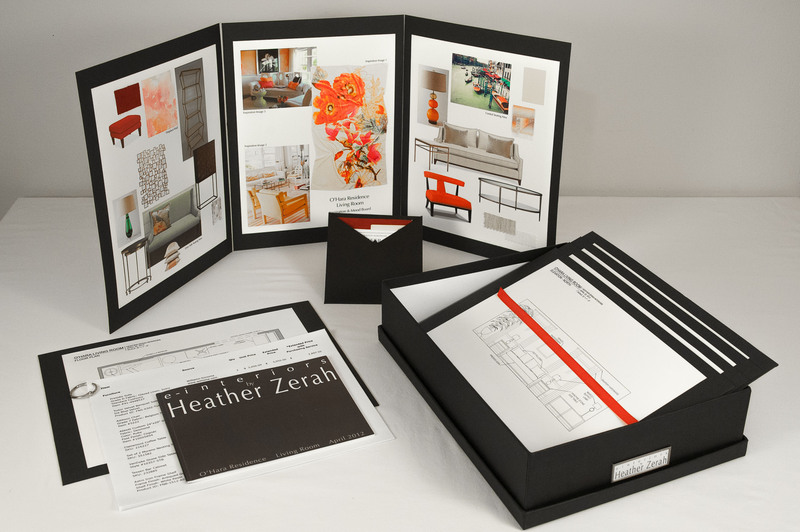 Through my own business, E-Interiors by Heather Zerah, as well as through my work with the e-decorating website Tastemaker, I have found one element to be essential in the communication process: Mood Boards. 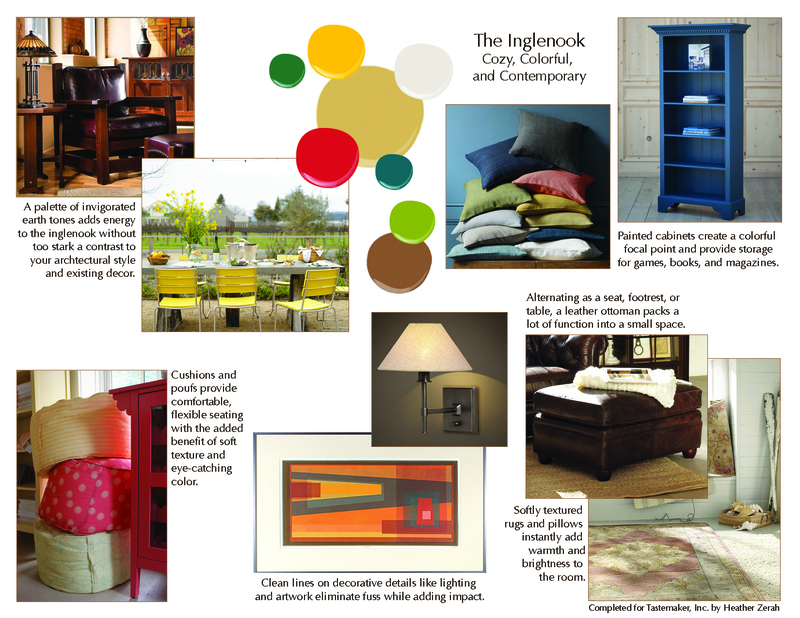 A Mood Board is a collage of images that represent the interior designer’s vision for a particular space. Mood boards often combine photos of rooms from design magazines and blogs, abstract images, and photos of furniture or decor that may eventually be used in the design. The designer’s vision is based upon the client’s initial description of their style, needs, and goals for their room. 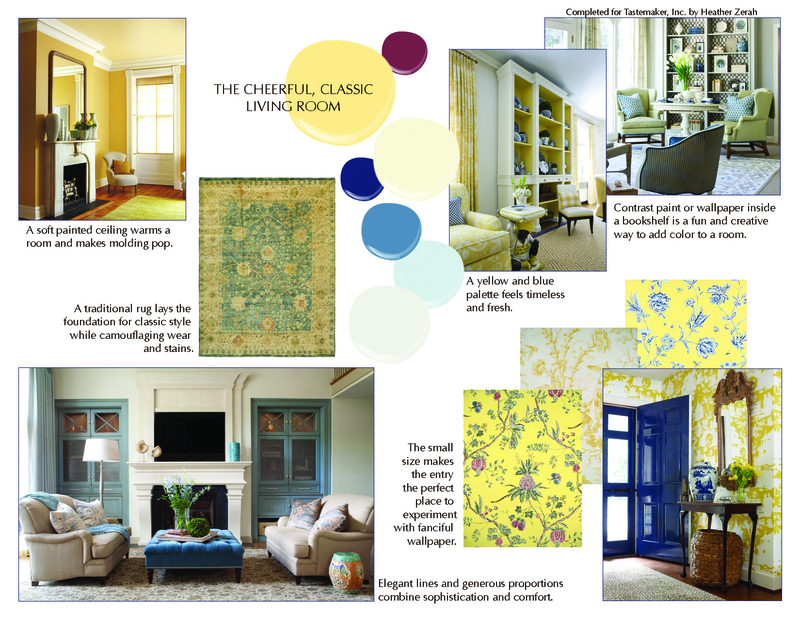 Usually presented in the early stages of the design process, the mood board is essential to ensure that the designer and client understand the direction a design is headed. Words can mean different things to different people. For example, a client and designer might have completely different perceptions of what the word “traditional” means, or what the color “green” actually looks like. By gathering images together in a mood board, a designer can paint a clear picture to convey style, mood, color scheme, and more. The client and designer can then discuss specific details of the mood board, whether good or bad, to make sure that all parties are in agreement. The end result is a hassle-free process where the designer knows what the client wants, and the client doesn’t receive any unwelcome surprises in the final design box. Due to the creative nature of interior design, you will find that mood board styles vary widely from one designer to the next. Personally, I like to incorporate a lot of text among my images. Just as the word “traditional” can mean different things to different people, images can be perceived differently. While I might include an image because I love the shade of blue paint on the walls, a client might only see an unattractive coffee table, thus missing the point of the image. By incorporating text I can call out specific details to help the client understand which elements of an image pertain to their room. Because every new room design is unique and personalized, it can be challenging to find images that truly capture a designer’s goal for a particular project. However, by incorporating verbal and visual information into a mood board and then listening closely to the client’s feedback, a designer can produce a one-of-a-kind look that fits the client perfectly. There is a new trend in interior design. Correction: There is a new way of doing business. The word “trendy” implies that something is of the moment but not permanent. Although it may seem like a trend right now, I think E-Design is here to stay. The best ideas are often born of necessity, and E-Design (also called E-Decorating, Virtual Design, Online Decorating, or Online Design) is no exception. The recent economic recession forced both individuals and businesses to reassess their way of doing things. As a luxury service, the profession of interior design was hit particularly hard. Personal spending, home improvements, and the construction industry are intrinsic to the success of interior design, and each of those sectors suffered major losses following the housing collapse and economic fallout. Luckily, interior designers are trained problem solvers. From this struggle to keep the industry alive, innovative minds came up with a new system, one that opens up the possibility of professional interior design service to a whole new array of clients. If you are not familiar with it, allow me to introduce you to the concept of E-Design. E-Design or E-Decorating services are typically offered for a flat fee based on room type (kitchen, bedroom, bathroom, etc.) or room size (small, medium, large, extra-large). 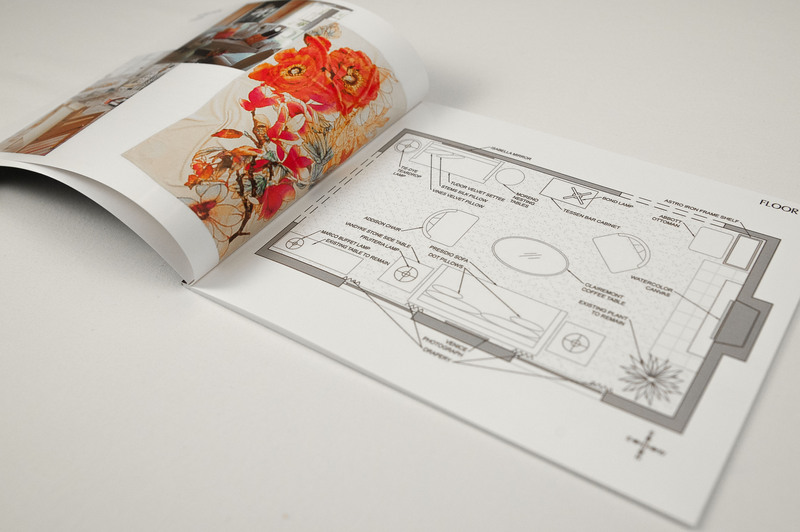 The client is responsible for measuring the space (most designers will provide detailed instructions on how to do this), gathering images that represent the mood or style they want for the room, and filling out a questionnaire to help the designer identify the most suitable design direction based on the client’s preferences and lifestyle. Correspondence is conducted via email and, in some cases, the phone. It is not necessary for the designer and client to live in the same geographic area. The interior designer analyzes all of the client’s information to create a design specifically suited to the client’s personal style, practical needs, and architectural details. It is then the client’s responsibility to purchase and install all of the specified elements (furniture, paint, etc.) based on detailed instructions from the designer. The specific elements included in the fee vary by designer. Some interior designers do everything online, sending floor plans and realistic renderings of the room, along with a shopping guide for all items specified in the design, via email. 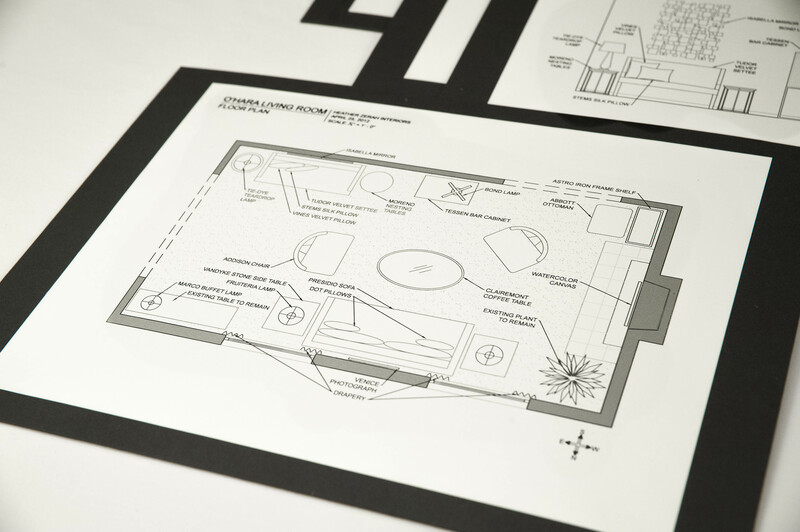 Other designers, such as myself, send the client an actual package in the mail that includes floor plans, drawings, material samples, shopping lists, instructions, or whatever elements the designer deems useful. Every designer has their own way of doing things, so it is important to compare options to make sure you get the type of service that suits you best. Personally, I like to touch and hold things in my hands, so I prefer to receive a design package in the mail. Similarly, E-Design and E-Decorating fees vary by designer, so its important to find a designer who fits within your budget. You can find everything from inexpensive a-la-carte options that allow you to target specific problems or questions, to the most expensive E-Design packages offered by “celebrity” designers. Regardless of whether you select the cheapest a-la-carte option or the most expensive celebrity-style re-design, you will find that the cost is significantly lower than that of full-service interior design. It is this cost difference that opens up E-Design service to a whole new array of clients. Whereas many full-service interior designers won’t even sign a contract without a retainer of several thousand dollars, a typical E-Design package fee may be anywhere from $600 for a tiny bathroom or entryway, to $2500 for a kitchen or great room. Besides accommodating a wider range of budgets, E-Design and E-Decorating also appeal to a new design-savvy client. The abundance of home-improvement shows, design magazines, and stylish furniture stores offering local and online purchasing and deliveries has led to a more style-conscious population. An attractive and comfortable home no longer seems out of reach to the average person. We all want to live in rooms that resemble those we see on TV or in our favorite home furnishing catalogs. Unfortunately, accessibility does not always equate to time or good taste. Most people simply can’t find enough time in their hectic schedules to search through the huge assortment of options, and with so many to choose from, they may find it difficult to make a decision. What initially seems like an exciting new weekend project becomes exhausting and overwhelming. With E-Design, these people are able to do the fun brainstorming part where they tear out magazine pages, but then they hand the process over to the professional who will be able to sift through the multitude of retailers to design a unified, cohesive space. It is then up to the client to order furniture and implement the design scheme at their own pace, without having to hand over a big check for furniture and services all at once. As an interior designer, I’m excited about the potential of E-Design. The concept is fairly new, but I think it will catch on in a big way. I have added E-Design to my own list of services, but I can’t take credit for the idea. I was quite content doing business the old way for many years. I was lucky enough not to be significantly touched by the recession while I was working as an interior designer in New York City. It wasn’t until I moved to California following the birth of my daughter in 2011 that I saw just how hard the interior design industry had been hit in the San Francisco Bay Area. I realized that if I was going to work in this tough business climate, I needed to find a new way of doing things. After reading an article about E-Decorating in Better Homes and Gardens magazine, I began noticing E-Design popping up all over the place, in a wide range of forms, and I knew that I wanted to be a part of it. I absolutely think that full-service interior design is a valuable service for the right client. A major home renovation can entail a huge scope of work that many people simply don’t have the time or skill to oversee. In these cases, a full-service interior designer is worth every penny. I myself continue to offer full design services, as well as E-Design services, with the understanding that projects of all scope, size, and budget deserve professional attention. However, for those individuals with a DIY attitude but glossy magazine aspirations, E-Design may be the perfect solution for achieving a professional look with minimal hassle at a reasonable cost. 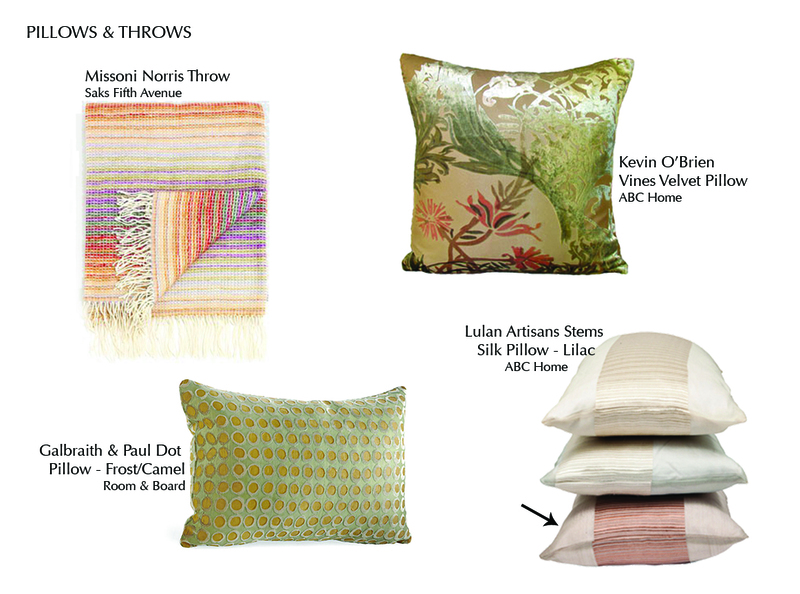 Home Style: Color and Pattern, Oh My!